This strike release kit contains two plate options to create a 'universal' solution for rim and mortice applications. 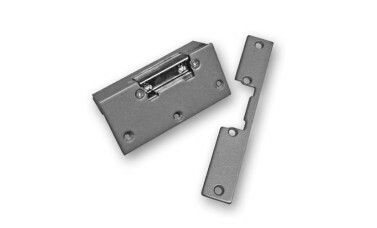 The kit comprises of an electric strike release module, alongside a flat strike plate for mortice applications, and also a surface housing for using the strike release with a rim lock. Depending on the application (surface or mortice), you would choose which plate you are going to use, and fasten the release module onto the strike plate / surface housing. This type of solution is a fantastic idea for installers who don't always know the application before they get onto site, and is very useful to exclude the need to double check before buying! Both plate options are finished with a grey powder coating, and the release module itself features the much-loved adjustable jaw functionality, allowing for post-installation adjustments to ensure the latch is correctly latching into the strike. Available in fail-locked (fail-secure) on 12v AC or DC, and also in a fail-unlocked (fail-safe) model on 12v DC only.